Google To Buy Digg for 200 Million? What do you get when you combine Google search engine and Digg social voting: Giggle. 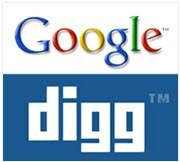 There is a strong possibility the Digg users will have their usernames transferred to Google accounts. I can’t wait to see the uprising on digg when they realize all their voting and browsing history will be transferred to Google, and Google will use this to their advantage. Users have a history of mob like behavior and are prone to shooting first and asking questions… someday. Google has ad technology to pinpoint the best ad to the right user, so they must believe they can pay for this acquisition in a few years. The purchase price is reportedly 200 million which is approximately $66 for every registered user, assuming there are 3,000,000 digg users. For comparison, AOL paid about $40 for every Bebo.com user and eBay purchased the social networking site StumbleUpon for about $45 million, valued at $20 per registered user. The big difference is it is extremely difficult to monetize StumbleUpon.com, while digg.com has lots of advertisements. Diggers must click on a lot of ads – oh wait no they don’t. Currently Microsoft is providing ads to Digg, but this should immediately change with a Google takeover. As reported by TechCrunch and commented on by scores of excited, nervous, hyped, curious, incredulous and indifferent blogs. Where are the Google haters? If you are furious about this deal we want to link to you. Digg is currently the 115th most popular site on the internet according to Alexa. 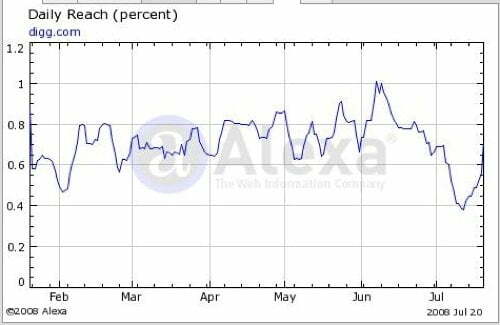 Digg traffic is extremely volatile, dropping over 100% last month before rebounding. If the Digg owners wish to sell their site, I’ll line up as a buyer. I think it is likely that Google will resume Digg negotiations this summer. The traffic fell by 50% and increased again by 100%. It didn’t fall by over 100% – that would mean it’d dropped below 0.